Rapunzel, Rapunzel, let down your hair! 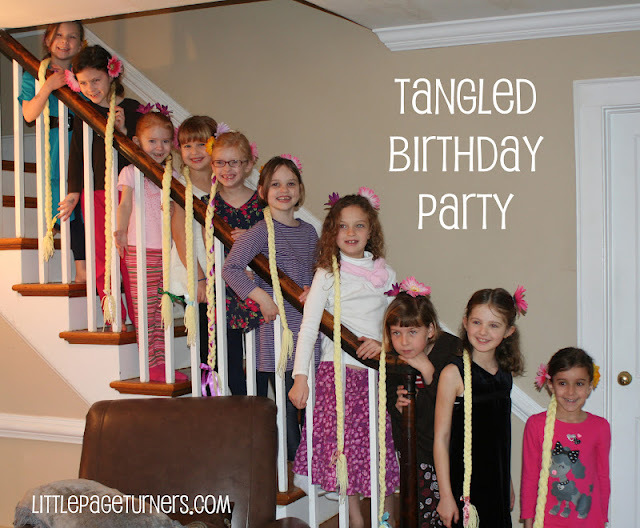 Our Tangled-themed birthday party was a great success - 10 little princesses had a wonderful time with all-things-Rapunzel. 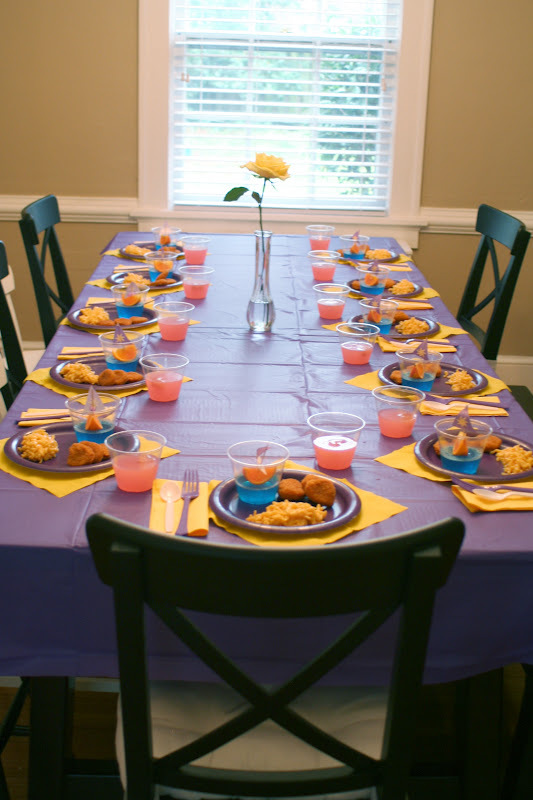 I pulled the party together in a week, so all of the ideas here are easy to do in a short amount of time and on a budget. Instead of balloons, we marked the house with a skinny yarn braid hanging from our lamppost "tower". 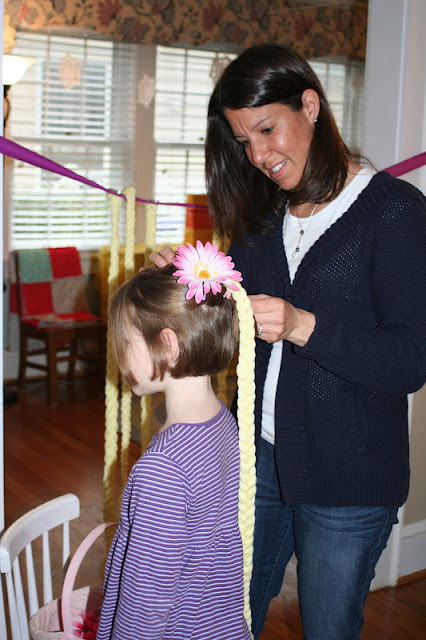 When the girls arrived, they were ushered to our makeover station where they got to choose a braid and some accessories. 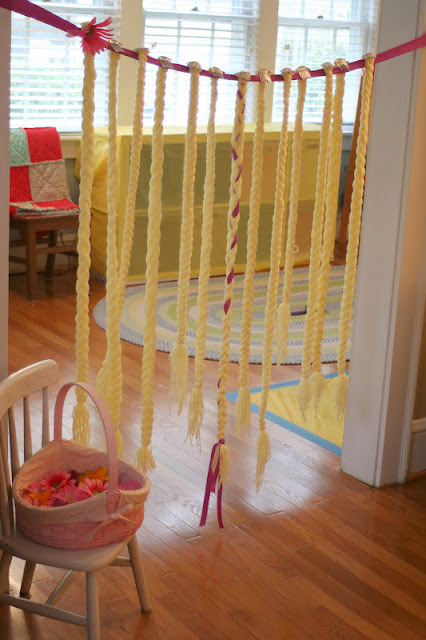 To make the braids I cut yellow yarn into 4 - 4 1/2 foot strands. Three bunches of 15 strands made a nice thick braid, and I was careful not to braid it too tightly so as to keep it fluffy. I tied off each end with yarn and trimmed one end to hot glue onto Mini Tiara Combs. Find a good show to watch a marathon on Netflix while doing these! They aren't difficult but will literally take hours. For the birthday girl's braid I added a purple ribbon and did her hair up in a bun ahead of time. She looked so pretty! To entertain the girls while waiting for everyone to arrive and become Rapunzelfied, I turned on Tangled in the background. Every time there was a lull in the party, I simply unpaused the movie, pausing it again when we were ready to move on to the next activity. 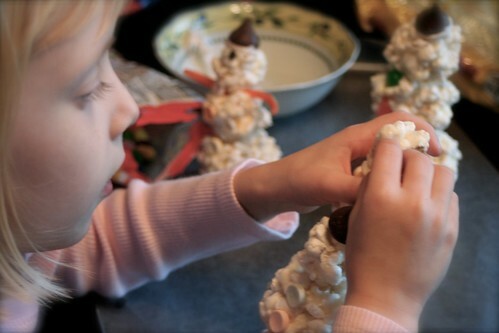 When the girls had all arrived, we started the craft. Each child was given a kit containing a plastic string, beads, and a (paper) sun pendant. I made good use of the free printables from Paging Supermom throughout the party planning, including for the pendant. The pendant was simply glued to the back of a bead. I used craft glue, but I think a hot glue gun would have better success in staying on. 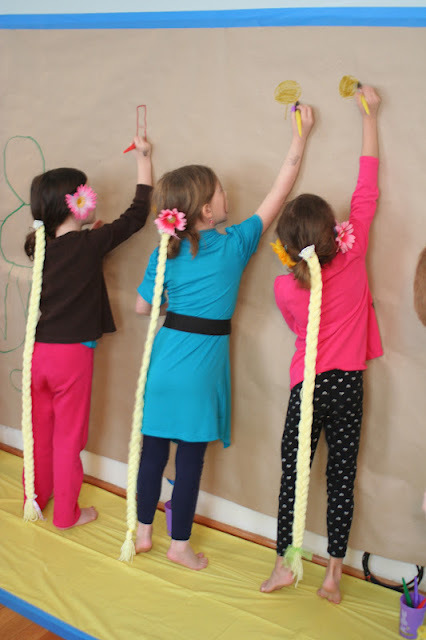 While the first set of girls worked on the necklaces, the rest of the guests painted the wall, just like Rapunzel does in the movie. I taped a huge piece of butcher paper to the wall, taped a plastic tablecloth to the floor, and provided the girls with Crayola's new paint brush pens. These "paint pens" are actually markers with soft tips shaped like a paintbrush. I was a little disappointed there wasn't any actual paint involved (false advertising on Crayola's part), but they ended up being fine for this project. Then it was story time! I asked my mom to read the girls the traditional Rapunzel story (which few of them had heard), while Karen, my husband, and I fixed lunch. It was so cute to hear the girls all chant together: "Rapunzel, Rapunzel, let down your hair!" I've seen lots of incredible Tangled-themed menus in the blogosphere involving hazelnut soup, gourmet cheese and fruit platters, and braided bread. But these are seven year olds. I served chicken nuggets and mac & cheese (spiral shapes for Rapunzel's curls). And of course I couldn't resist doing the orange slice/berry jello boat. These lanterns were my "big splurge" for the party at a whopping $6 for the set. I found them at Party City and they added the perfect touch. And finally... the cake! I baked the base in a mixing bowl and used a leaf tip to create the "grass" and vines. Cake decorating is not my forte, so I kept it as simple as possible. 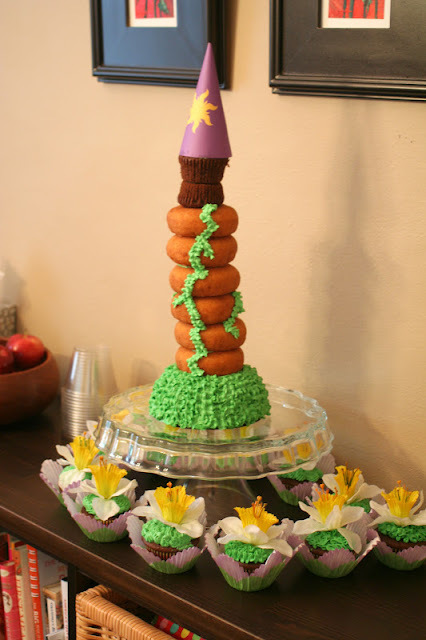 We used a dowel placed into the base of the cake to help stack the donuts and cupcakes. The birthday girl had a blast with her friends and classmates, and I loved giving her a very happy birthday. I still can't believe my eldest is SEVEN! Happy Birthday, E! Sounds like a lot of fun! I love how everything was pretty simple. LOVE the cake! Absolutely adorable! Great ideas! I shared it with my FB audience! This party looks wonderful. 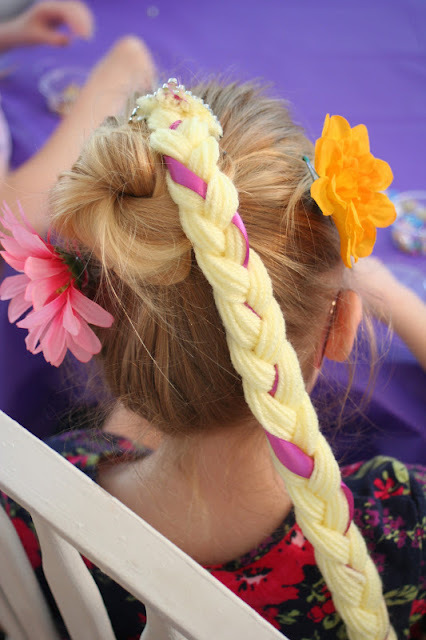 I love all the ways you used braids. Awww, so much fun! I'll admit that I'm still disappointed that there weren't any leftover braids. hehe... There are no parties like the ones at the Page house! Oh how cute! I love the jello/orange boats! I am sure you all had so much fun! What a perfect party! I love all of the cute details. You did a good job in only a week of planning! What a magnificent party!!!! so many creative and delightful details. So much fun and love. HAPPY HAPPY birthday to your sweet seven year old!!! So great! 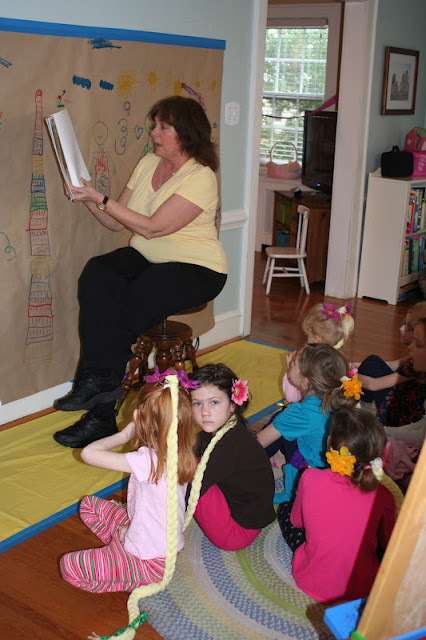 I want to be a kid again so I can come to one of your creative birthday parties! 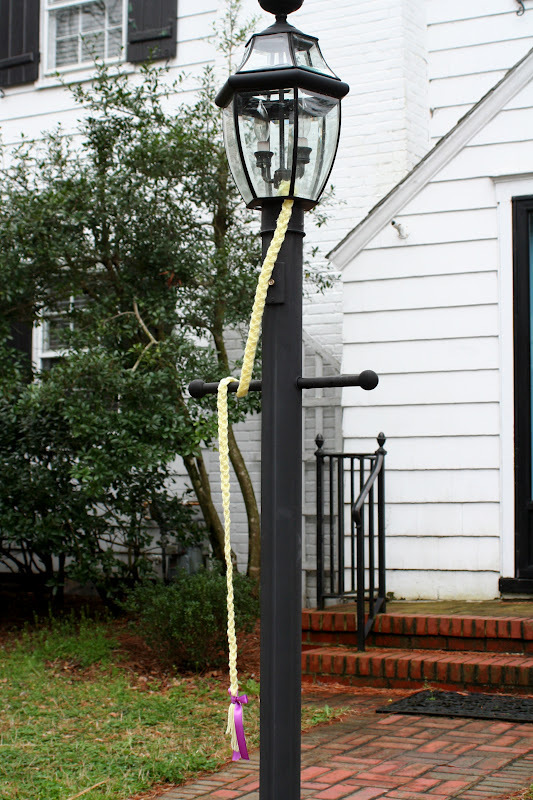 I wondering how long the braid that was on the lamp post was? Thank you for your ideas! 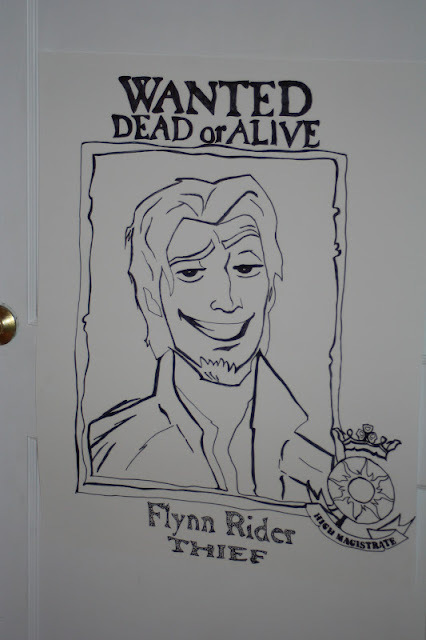 Mine is turning 7 and wants a tangled theme. I love the cake. What did you use as the top? Is it an up-side-down ice cream cone? Kathy - I have no idea. Maybe 4-5 feet? :) Aimee - Thanks! This is probably way too late, but no, it wasn't an ice cream cone (although that would work too). It was just cardstock - another printable from Paging Supermom.